This book with table prayers contains a dedication for Fradche, the wife of Moses Gundersheim. 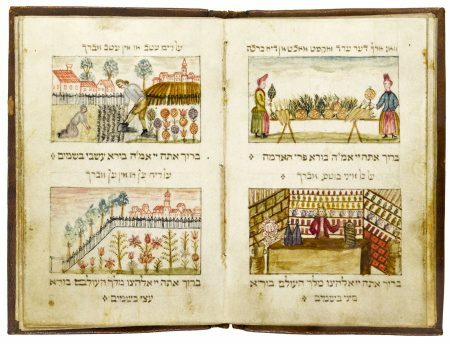 A well-known sofer, a Torah scribe, wrote it down and decorated it with illustrations. The festive framing on the title page was printed and the title was added in handwriting. Birkat ha-Mazon (Grace after Meals), 1725, by Samuel ben Zwi Hirsch Dresnitz, Nikolsburg (today Czech Republic), parchment.